Spend your vacation relaxing at Willow by the Lake Resort, just 10 minutes north of downtown Ludington, right on the east shore of beautiful Hamlin Lake. Choose from four comfortable, clean cottages at the resort. All cottages are air-conditioned, have a picnic table and charcoal grill, furnished with dishes, cooking utensils, blankets, and pillows (Guests must supply bed sheets, pillow cases, and bath & kitchen towels). Kitchens in all cottages have electric range & oven, refrigerator, microwave, toaster & electric coffee maker. A fire pit is available near the lake, as well as a sandbox for children to play in. 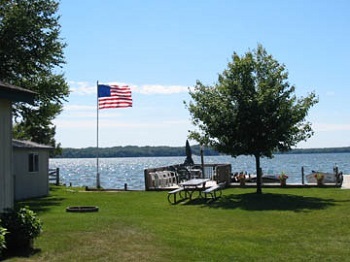 Experience excellent swimming, boating, and fishing on Hamlin Lake. 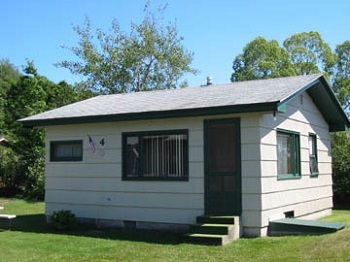 This cozy two-bedroom cottage has knotty pine walls in the living/dining room. Each bedroom has a full size bed and the living room has a full-size foldout sofa bed. Includes an equipped kitchen and stall shower. Maximum of six guests. A unique two-bedroom cottage with separate kitchen/dining area. This cottage has a cozy living room with a view of the lake. Each bedroom has a full-size bed and the living room has a full-size foldout sofa bed. Includes equipped kitchen and stall shower. Maximum six of guests. Ideal get-a-way for a couple. A small one-bedroom cottage with a full-size bed. The living/dining/kitchen area also contains a foldout sofa bed to accommodate two small children. Equipped with kitchen and stall shower. Maximum of four guests. This one-bedroom cottage with a combined kitchen/dining/living room area has a view of the many beautiful sunsets over Hamlin Lake. The bedroom has a queen size bed and a twin bed. There is a full size foldout sofa in the living room. Equipped with kitchen and stall shower. Maximum of five guests. Weeks begin & end on Saturday. Check-in is after 3pm, check-out time is by 10am on the day of departure. NO pets are allowed, please. 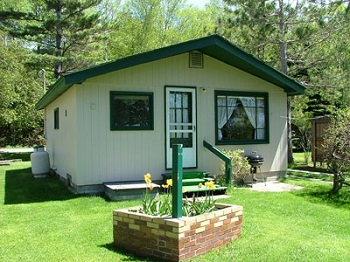 Reservation deposit of $100 per cottage for each week, balance due on arrival. We accept checks or cash only, no credit cards. Open June through September. Off-season is after Labor Day. Daily rate available during off season only for a minimum of two nights. DIRECTIONS: Travel US-10 through the city of Ludington to Lake Michigan and turn right on North Lakeshore Drive. At approximately 2-1/2 miles, as M-116 curves left, turn right on Lakeshore (just past the Country Store). Travel Lakeshore Drive north, turning left over the bridge (at Waterside Resort), and follow the shoreline of Hamlin Lake until you see our sign (about 4 miles).